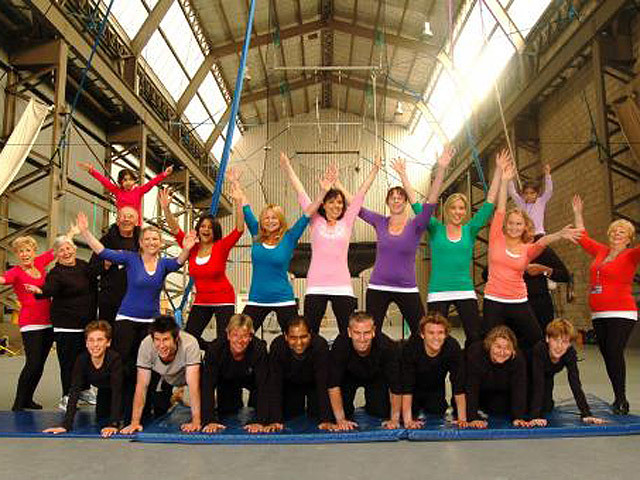 Why Choose Sydney Trapeze School? Are you tired of the same old boring team building events held in hotel conference rooms or the office board room? 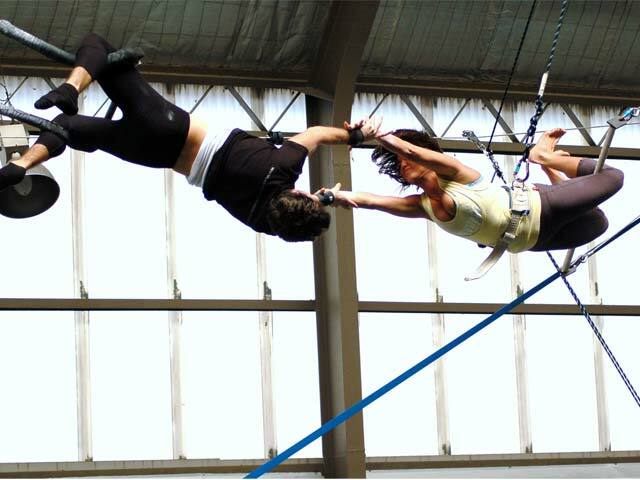 Sydney Trapeze School has an awesome idea for your next team building exercise. Join us for a fun filled and exhilarating session of Flying Trapeze or Circus Skills. Enjoy watching your boss and colleagues fly though the air with the greatest of ease, master the art of juggling, perform plate spinning and all things circus. 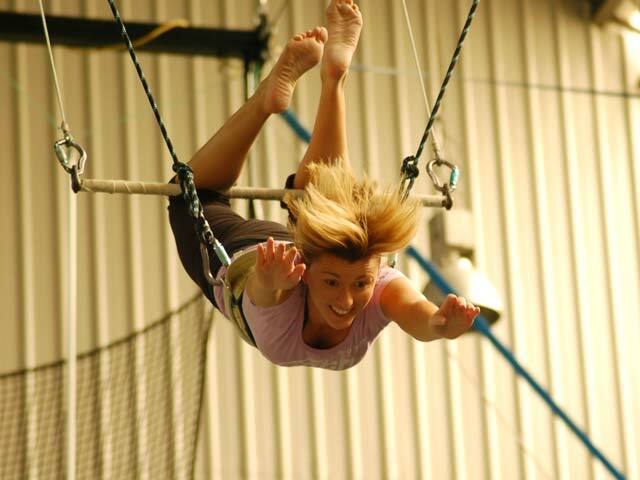 Groups with less than 12 people can enrol into our Flying Trapeze ‘All Levels’ Classes running throughout the week. 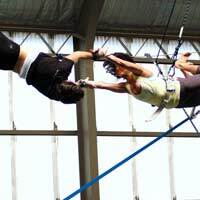 This is the ideal package for those groups interested in learning the Flying Trapeze only. 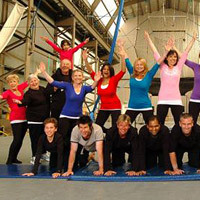 This fun filled experience dedicates 2 whole hours to your group to learn the basic trapeze positions and finish with an attempt at a mid-air catch with one of our experienced instructors. Those who progress quickly in this class will also have an opportunity to learn more advanced positions/tricks in the air. Watch your team mates challenge themselves and see how many of them are as brave as they say they are and who can complete the final task of a successful mid-air catch! "When one of my colleagues first mentioned Sydney Trapeze School as an option for our next team event, I knew nothing at all about trapeze. My research took me on a pretty rapid rollercoaster, which went something like "This could be awesome" to "This will be awesome" to "I am booking this right now". Somehow, the event managed to live up to - and even exceed - my expectations. It's the perfect blend of adrenaline, fun and teamwork. Wouldn't hesitate to recommend it to anyone! Keep being awesome guys, was seriously a lot of fun :)"
This experience is catered for larger groups who are interested in learning several circus acts. We have a number of activities on offer to teach; aerial arts, plate spinning, juggling, tight rope walking, stilt walking and of course the Flying Trapeze. The number of different activities taught in your experience will vary depending on the number of students. We recommend 1 activity for every 10 people (i.e. 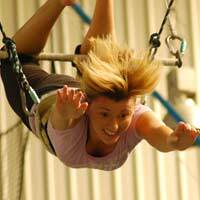 for 30 people you would have flying trapeze plus a choice of 2 other additional activities). Learn to spin a plate continuously using only a plastic stick. You will even learn the tricks on how to pass a spinning plate along to your workmates, keeping it spinning the whole time! Learn to juggle three balls at the same time and show off your new learnt skills to your mates! Test out your sense of balance on our tight wire, show your workmates you can walk the fine line! Learn how to perform beautiful poses and shapes on two pieces of fabric hanging from a single high point. This activity will really test your flexibility and strength! Using only a metal hoop suspended from the air, learn how to perform daring positions and shapes mid air.